Multiferroics are materials with simultaneous ferroelectric and magnetic orders. Such materials are promising for the development of new nanometric memories with reduced energy consumption or memories with four programmable states. Unfortunately, one of two ferroic properties is always predominating in real systems. Thus, extrinsic multiferroic systems composed of ferroelectric and ferromagnetic bilayers, which allow the manipulation of the magnetization or the polarization either by an applied magnetic field or an electric field, are an interesting alternative. 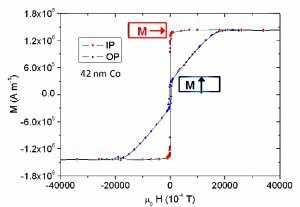 Researchers of the INSP laboratory in collaboration with colleagues from CEA/SPCSI have achieved a major progress by demonstrating the magnetoelectric coupling between the magnetization of a nm ferromagnetic Co film and the polarization of a nm ferroelectric BaTiO3 thin film. BaTiO3 epitaxial films have been grown by oxygen plasma assisted molecular beam epitaxy on Nb doped (001) SrTiO3 substrates. Films with thickness >10nm present at room temperature the bulk tetragonal crystal structure of BTO with a practically monodomain polarization oriented perpendicular to the film surface (Fig.1a). By applying moderate tension (e.g. 2 V), this polarization may easily be switched in the opposite direction. Subsequently, a 5 nm to 40 nm thin polycrystalline Co layer with an abrupt interface is grown on top (Fig.1b). Despite the thin film geometry a notable remanent magnetization is measured perpendicular to the film plane (Fig.1c). This observation is attributed to the presence of the BTO film as the polycrystalline character of the Co film excludes magnetocrystalline anisotropy effects. a) Piezoresponse force microscopy image of BaTiO3 domains with a quasi-single polarization orientation. b) Transmission electron microscopy image of the Co/BaTiO3/SrTiO3(001) system. 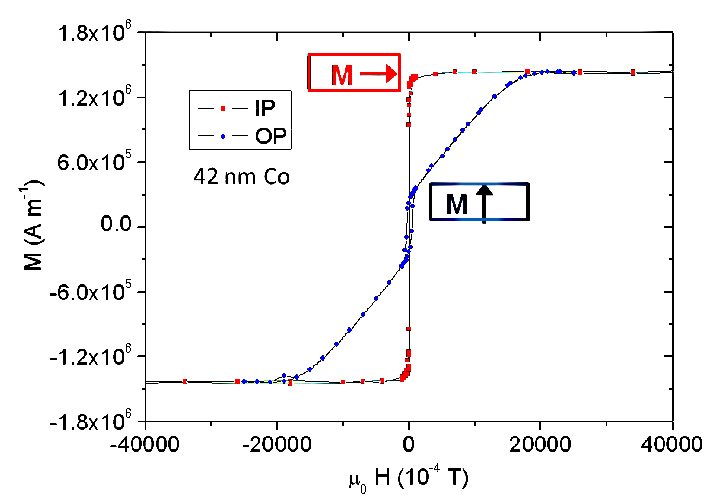 c) Magnetization hysteresis loops of the Co film in the in-plane and out-of-plane configurations. The quasi monodomain polarization of the BTO film allows the investigation of the magnetization of the Co film for different orientations of the magnetization : parallel or antiparallel to the polarization or perpendicular. The coupling is evidenced by ferromagnetic resonance spectroscopy. The resonance field of the uniform mode (which corresponds to the field for which the magnetization precesses around the local magnetic field at the Larmor frequency) is shown to depend on the // or anti // orientation of P and M which is a direct proof of a magneto-electric coupling and also on the temperature (Fig.2). By going through the BTO tetragonal versus orthorhombic phase transition at 278 K we observe a reduction in the coupling corresponding to the reduced polarization of BTO in the low temperature phase. Ferromagnetic resonance field values as a function of temperature for different geometries : (a) M anti-// P, (b) M // P, (c) M perpendicular to P.